You are cordially invited to “Party in the Sky!” at the 9th Annual Havasu Balloon Festival and Fair; designated as one of THE TOP 100 EVENTS IN NORTH AMERICA by the American Bus Association -- an event you do not want to miss! 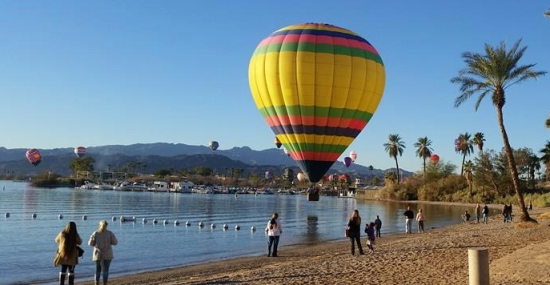 The balloons love to soar over Lake Havasu City and in and around the Bridgewater Channel and the London Bridge, so get your cameras ready. Giant balloons lightly touch the water and quickly ascend if there are no boats or non-motorized craft or persons in harm’s way. If you want to experience ballooning from lift-off, bring your cameras and watch as the balloon teams ready their rides for ascent and experience up close and personal the heat of the burners as the teams rise into the sky on the balloon field on the island or around town where they are lifting off. Balloon teams will be available throughout the weekend to talk about the art and history of hot air balloons.